One of the most beloved Christmas stories ever written takes on a decidedly New Hope twist when Buck County Playhouse brings back the popular comedy, “Ebenezer Scrooge’s Big Playhouse Christmas Show,” December 7 through December 30, 2018. Five actors, lots of music, laughter and one of the most beloved holiday stories ever told come together for this Christmas show that is perfect for the entire family. Terrorizing the good citizens of Bucks County, Ebenezer Scrooge rediscovers the spirit of Christmas in this riotous Dickens mashup set in New Hope. All the traditional elements of Dickens’ “A Christmas Carol” are intact — including the iconic ghosts of Christmases Past, Present and Future — comically reimagined in this holiday frolic. 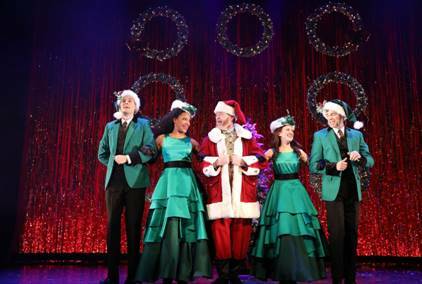 The authors have rebooted the story — charging five talented actors with the task of playing nearly three dozen roles, as well as instruments, while infusing the show with a lot of comedy and harnessing the energetic joy of the season. Written by Gordon Greenberg (“Irving Berlin’s Holiday Inn”) and Steve Rosen (“The Other Josh Cohen”), this year’s version of the show is directed by Greenberg and features some new exciting twists and turns plus an extended musical finale. Executive Producer Robyn Goodman, Producing Director Alexander Fraser and Producers Stephen Kocis and Josh Fiedler recently announced details on the show, which is making its return to Bucks County Playhouse after becoming the most successful holiday production in the Playhouse’s history last season. The cast stars Broadway and film veteran William Youmans as Ebenezer Scrooge. Mr. Youmans has appeared on Broadway in the original casts of “Wicked,” “Carousel” (2018 revival) and “The Little Foxes” (with Elizabeth Taylor). He is joined by James Ludwig (Broadway’s “Monty Python’s Spamalot” – Original Cast and BCP’s “Million Dollar Quartet), Sarah Manton (Broadway’s “One Man, Two Guvnors” and National Theatre, London’s “South Pacific”), James David Larson (National Tour of “Buddy: The Buddy Holly Story” and BCP’s “Million Dollar Quartet”), and Tina Stafford (National Tour of “Once”). Michael Baxter is the Assistant Director. Michael Carnahan is scenic designer. Tristan Raines is costume designer. Travis McHale is lighting designer and Bart Fasbender is sound designer. Ashley Rae Callahan is the Wig Designer. Casting is by Geoff Josselson, CSA. In coordination with the production and as part of the Playhouse’s education program, Bucks County Playhouse is once again offering the opportunity for local theater-lovers and aspiring thespians to join a cast on the historic Playhouse stage as “Scene-Stealers.” Designed as an educational opportunity, the “Scene-Stealers” will be featured in the musical finale in “Ebenezer Scrooge’s Big Playhouse Christmas Show!” Seated in the audience, participants will also be able to watch and enjoy the show until it is time to take the stage. Following curtain call, “Scene-Stealers” will lead audience members into the Courtyard to sing Christmas Carols. “Ebenezer Scrooge’s Big Playhouse Christmas Show” will run from December 7 through December 30 and will play matinees on Wednesdays, Thursdays, Saturdays and Sundays at 2 p.m. and evenings on Tuesdays and Thursdays at 7:30 p.m. and Fridays and Saturdays at 8 p.m. There is an added show on Wednesday evening, December 27 at 7:30 p.m.
Tickets to “Ebenezer Scrooge’s Big Playhouse Christmas Show” begin at $40. Special rates for groups of 10 or more. For complete details, and to purchase tickets, please visit buckscountyplayhouse.org, call 215-862-2121, or visit the box office at 70 South Main Street, New Hope, PA. Bucks County Playhouse is a year-round, nonprofit theatre that has grown to a $6 million producing organization with an annual audience of over 73,000. Founded in 1939 in a converted 1790 gristmill, Bucks County Playhouse quickly became “the most famous summer theatre in America,” featuring a roster of American theatrical royalty including Helen Hayes, George S. Kaufman, Moss Hart, Kitty Carlisle, Angela Lansbury, Alan Alda, Tyne Daly, Bernadette Peters, and Liza Minnelli and remained in continuous operation until 2010. In 2012, the Playhouse re-opened after a multi-million-dollar restoration thanks to the efforts of the Bridge Street Foundation, the nonprofit family foundation of Kevin and Sherri Daugherty, and Broadway producer Jed Bernstein. This December, the Playhouse will unveil a 4,000 square foot Delaware-river view restaurant and bar expansion. In 2014, Tony Award-winning producers Alexander Fraser and Robyn Goodman took the helm of the Playhouse, and today the Playhouse has reclaimed its reputation of attracting Broadway and Hollywood artists. Its productions of “Company” starring Justin Guarini, and William Finn’s “The 25th Annual Putnam County Spelling Bee” were named by Wall Street Journal to its “Best of Theatre” list for 2015. The 2017 season included four world premieres and audiences grew by over 34%. Box office record has been repeatedly broken by signature productions of “Buddy: The Buddy Holly Story,” “Steel Magnolias” directed by Marsha Mason, and “Million Dollar Quartet,” “42nd Street,” and “Guys & Dolls” directed by Hunter Foster. The creative teams who come to create new productions at the Playhouse are among the most talented artists working in the professional theatre today and relish the opportunity to work on the historic stage where Grace Kelly, Robert Redford, and Jessica Walter began their careers. Previous Tribe of Fools is “Evolving” their yearly tradition with their 9th Annual Holiday Burlesque! Next Mamma Mia! marks CTC’s debut at Studio One at The Grand December 7 – 15, 2018.